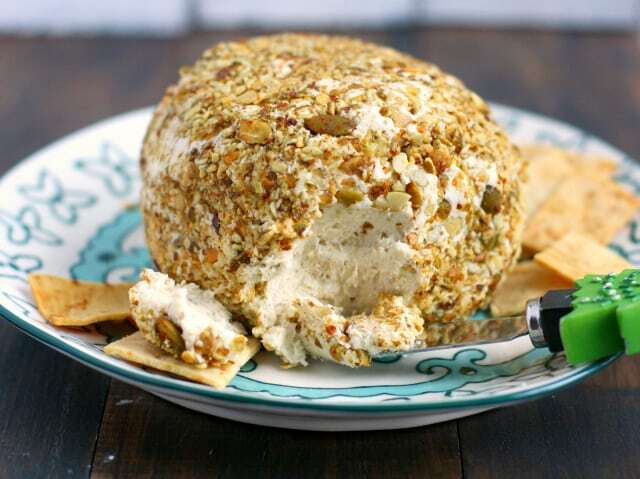 Home » Appetizers » Easy Vegan Cheese Ball (Nut Free). 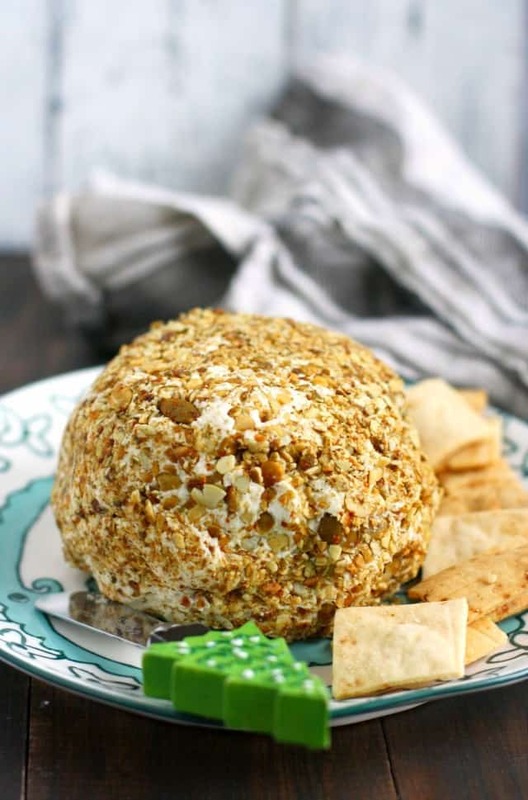 An easy recipe for a creamy, flavorful vegan cheese ball with a kick! Spicy pumpkin seeds and creamy dairy free cheese make this the perfect allergy friendly recipe for a party! A vegan cheese ball? Is that even possible, you ask? 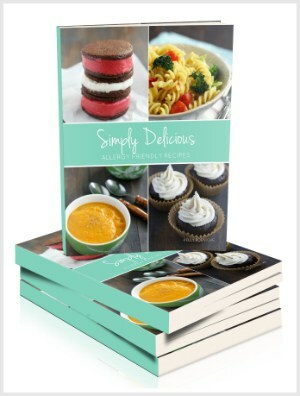 When the holiday season arrives, it’s time to find some delicious appetizer recipes. If you’re trying to keep things simple, chips and salsa is easy, as is guacamole. And bonus, they’re both naturally allergy friendly! But if you’re preparing for a holiday party, you want to make something a little bit more special. If you’re dairy free, you may think of all the cheese at holiday parties with a feeling of longing. A cheese platter with crackers and fruit, and maybe even a cheese spread or nut-encrusted (yikes!) cheese ball just says holiday party, doesn’t it? Well, good news, friends! You can still enjoy a good cheese ball. This vegan cheese ball is dairy free, gluten free, vegan, and nut free. It’s just right for a party or a game day, or a special event. Can you make a vegan cheese ball without nuts? Yes, you definitely can! Of course, many vegan cheese recipes, especially creamy cheeses, call for cashews as the base. But this cheese ball recipe is totally free of nuts. It uses two types of Daiya cheese – the cream cheese spread, and the block jalapeno Havarti cheese. When blended together, it makes a very creamy and tasty spread for crackers. 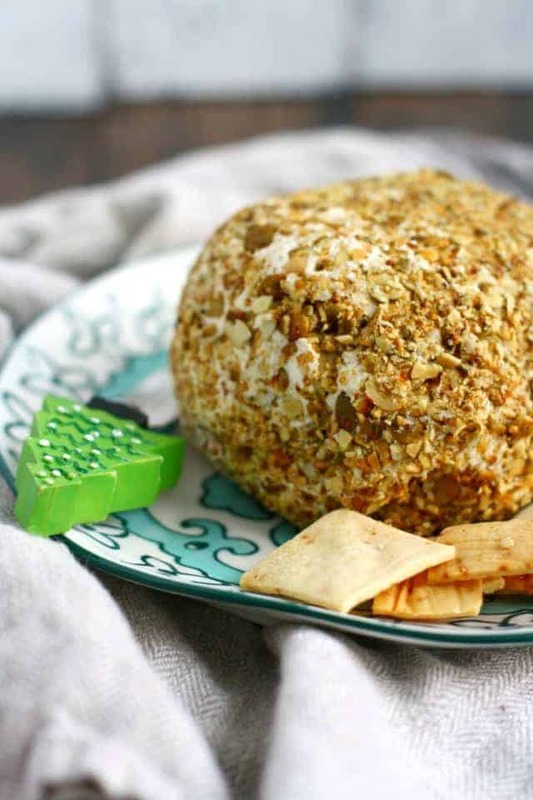 This vegan cheese ball recipe is so easy – it’s perfect for when you’re busy or in a hurry. (You know, hiding stuff in the closets before all the guests arrive). ;) Somewhat Spicy SuperSeedz give this cheese ball a little kick, but if you want to change the flavor, you can use any flavor of SuperSeedz or even sunflower seeds if you prefer. 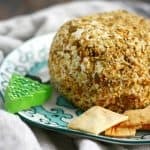 This vegan cheese ball tastes cheesy, and spicy, and yummy. It doesn’t taste like it’s dairy free, and you won’t miss out on the nuts, because the seeds add a nice crunch. 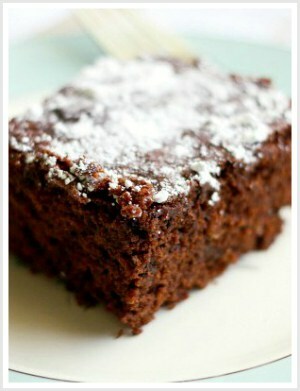 In fact, I bet you could fool your friends with this flavorful recipe…they won’t guess that it’s allergy friendly! My gluten free crackers go perfectly with this cheese ball, although if you’re having a party you’ll want to make several batches of them. Or just serve this spread with a store-bought cracker that works for your allergy needs. You could also try these homemade oatmeal crackers – they’re always a crowd pleaser. Grind the pumpkin seeds in a food processor. Remove most of them, then add the vegan block cheese. Process until the cheese if finely chopped. Add the vegan cream cheese, vegan buttery spread, and the spices. Process until very smooth. Place the pumpkin seeds on a place, and place the cheese mixture on top. Form a ball, and roll until it is coated in the seeds. Wrap in plastic wrap and chill in the refrigerator. Take a look at what dairy free cheeses are at your local store. 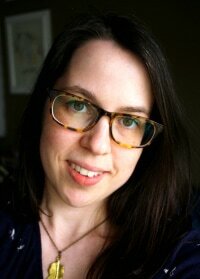 Of course, you should start by reading labels. If you find one that looks safe for your needs, call the company to double check on the manufacturing process. 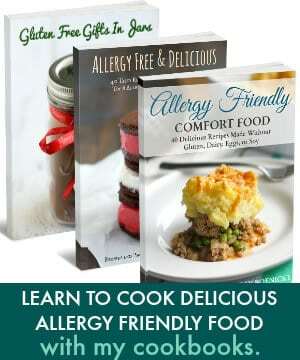 Make sure it truly is safe for your allergens. Try the cheese at home! Remember, some cheeses will work better than others in different recipes. You may not like vegan cheese shreds cold in a salad, but they may be great melted in a quesadilla. Be patient, and willing to experiment. This guide to vegan cheese may help you as you experiment. 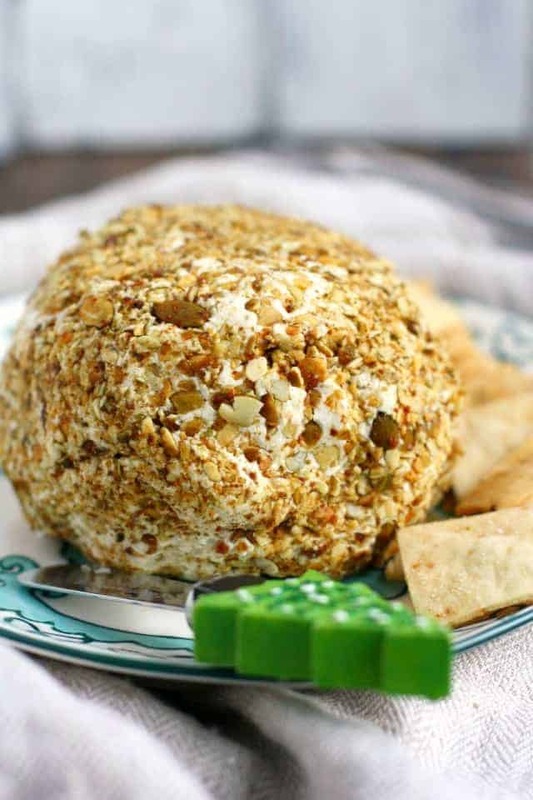 A flavorful and delicious vegan cheese ball is just right for a party or game day! Everyone loves this tasty appetizer. Place the spicy pumpkin seeds in a food processor and pulse until they are coarse crumbs. Remove all but two tablespoons of the seeds and put on a plate. Set aside. Add the cubes of Jalapeno Havarti cheese to the bowl of the food processor. Pulse until the cheese is pretty finely chopped. Add the Daiya cream cheese, vegan buttery spread, garlic powder, and cumin, and mix on high speed until smooth and combined. Scrape out the cheese mixture and place on the plate with the pumpkin seeds. Use your hands to form a ball and roll in the seeds until it is coated. Wrap the cheese ball in plastic wrap and put in the refrigerator. Chill for at least one hour before serving with crackers or cut up veggies. This cheese ball should keep in the refrigerator for up to 5 days. Substitute different seeds or nuts if you wish. Inspired by this recipe which I have made for past holidays (minus the nuts). This post was originally published in December 2016. It has been updated with new information and tips. This non-cheese ball tasted like real cheese! Served it to a bunch of discerning ladies and they couldn’t tell the difference, found it to be so tasty. Thanks so much for coming up with it and sharing. i love cheese so much and this made me giddy. You can find them at Whole Foods or other health food stores.